iTrinegy Network Emulators enable testing of systems and applications in different network environments ranging in quality from desired, disadvantaged to disrupted. Q: Your technology isn’t directly deployed with frontline troops, so how is it applicable to the modern soldier? A: I think the expression “No comms / No bombs” will be well understood by military personnel as it relates to the criticality of ensuring information (these days voice and data) is successfully delivered where and when it is needed in order to determine what action needs to be taken. All modern military, whatever arm - Army, Navy, Air Force - need effective data communications. Information flow is key and this is not just confined to battlefield situational awareness but also extends into other areas such as logistics because making sure your troops have access to the right kit is key to their fighting effectiveness. So, while our technology is never going to be used in frontline situations it plays a vital role in verifying that the networks, systems and devices the military rely upon to deliver vital information are not going to fail due to inherent limitations in the network. Our network emulators do this by creating accurate working facsimiles of different types of networks (Satellite, Mobile, Wireless, WAN, Cloud etc.) in which to test applications, devices and data delivery prior to deployment into the field. Taking this approach helps to mitigate the risk of application or system failures in poor networks. For the soldier this means the systems and devices they rely upon are going to work and in extreme cases it could be the difference between life and death. Q: Could you talk us through a few examples of how your equipment helps the modern soldier? A: Sure, let’s start with a soldier-carried situational awareness system. The basic problem these are solving is “Where are we? Where are our friends?” and “Where is the enemy?” The contractor tasked with creating this system used our network emulation technology to create a realistic test MANET environment which connected 30-50 devices simultaneously across different types of ad-hoc wireless networks, but rather than doing this in the field, all within the lab. They could then understand how, when a soldier entered a new input into their situational device, the system propagated information to other troops. Being a virtual test network, the contractor was able to fully control different network characteristics such as available bandwidth, latency and data packet loss to reflect changes in factors such as terrain, weather and enemy jamming and see how the system coped when operated in networks ranging in quality from desired, disadvantaged to disrupted. It helped the contractor identify and resolve issues long before the system was trialled in the field, leading to significant cost savings. More importantly, from the soldier’s perspective, because of the indepth pre-deployment testing undertaken, it provided them with a high degree of confidence that the system was going to work as expected when used in real deployed situations. A second example is the British MoD’s Land Systems Reference Centre which uses iTrinegy’s network emulation technology as an integral part of its test and reference facility to ensure the resilience of military communication and information systems throughout their lifecycle. Every application destined for use across for the core network needs to be proven as being viable to deploy in the live environment. Using the facility, applications are effectively “certified” as being fit for purpose in this environment and our network emulators provide a synthetic version of the network in which to conduct these tests. Any applications or systems that fail are sent back for reengineering or modification. 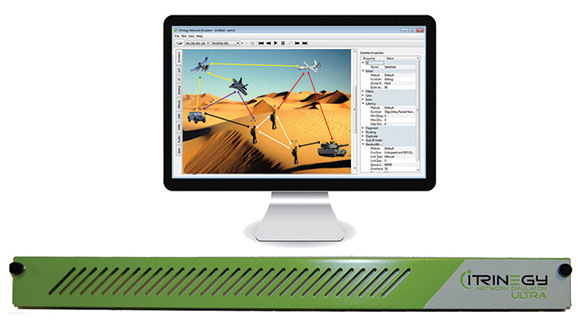 Our emulators are used to faithfully reproduce the conditions of the live military network including changeable or varying quality experiences as they are tried in different scenarios/theatres. A third example involves a distributed logistics system developed for a leading European army to help it deliver equipment, and spares, including armoured vehicles into theatres around the globe. Often, the locations will be in parts of the world where network availability is limited and quality is variable and their system needed to be able to cope with that, in order to ensure that appropriate asset information was available at all levels. The contractor developing this system used our emulator technology to provide them with a working replica of the network conditions that the system might be expected to operate under by mimicking a wide range of real-world conditions in their test lab. Again, our technology enabled them to truly understand and optimize the system’s performance and achieve a successful rollout. Q: What is next for iTrinegy and how are you hoping to develop out in government and defence areas? A: We have been working alongside our military customers and leading defence contractors for over a decade now and our objective remains the same, namely to perfect the most accurate and realistic test network environments available from extremely low bandwidth, high latency environments through to high speed, high volume set-ups in order to ensure application and systems performance is thoroughly tested prior to deployment by the military and government organizations. Looking forward, we know that network technologies will continue to evolve as witnessed by the imminent (at the time of writing) launch of 5G mobile networks and work being undertaken in the development of large scale satellite constellations operating in LEO (Low Earth Orbit). While these new systems should improve the soldier’s ability to access data and stay connected they also present new challenges. If you take LEO satellite constellations as an example, while the large number of satellites circling the Earth means you will never have to wait too long to be connected to the network, the high speeds (typically 17,500 mph) at which they are travelling relative to each other and land forces makes for an extremely dynamic network environment with parameters such as bandwidth, latency and error rates changing in fractions of a second. Understanding how applications, systems and devices cope with the possible “break-before-make” nature of these satellite circuits is going to be key to ensuring data will be completely downloaded onto soldier-carried devices. This is an area we are already actively engaged in and we can only see this becoming increasingly important in the military context. We also continue to work directly with the MOD, numerous branches of the US military, the Australian Government Department of Defence and leading global defence contractors as well as being involved in consortia such as CSIIS (The Command, Control, Communications, Computing, Intelligence, Surveillance and Reconnaissance - Secure Information Infrastructure and Services (CSIIS) Research Programme established by Dstl.